A common customer concern has always been the inability to give the user detailed explanations of why a password change has failed. 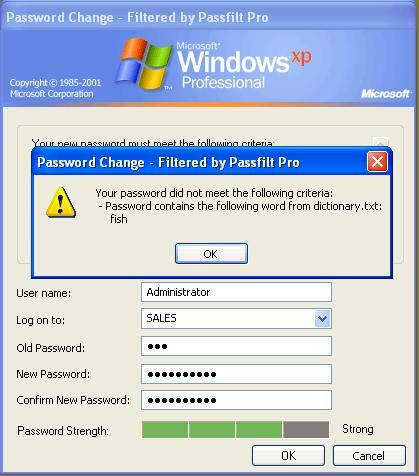 With no optional client software, users receive a generic Windows error message which offers little explanation for the disallowed password change. 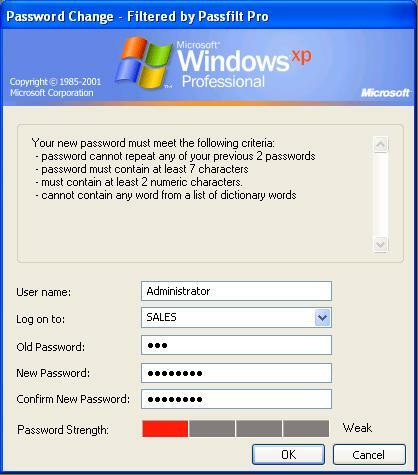 Working with Microsoft engineers Altus developed a client architecture which provides the password rules to the end-user and provides detailed reasons for password failure. The messaging is controlled via an encrypted rpc service on the domain controllers so the client text should prove to be easily updated by modifying the service on the domain controllers. The system has no single point of failure and any DC can provide the password rules and failure reasons to any client. Administrators also have the ability to insert a custom message at the top of the password rule listing. The client also includes an optional password strength meter that is controlled via Group Policies. 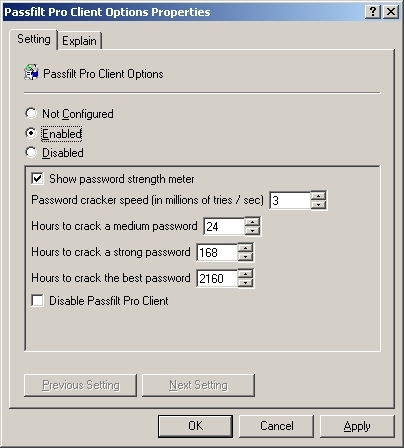 The administrator sets the password cracker speed and the number of hours to crack passwords of various strengths. The client can then dynamically gauge the password strength as the user types. The client works with Windows 2000 Professional and Windows XP. The client is the only client which uses a Microsoft supported architecture. To our knowledge there are only 2 other such clients worldwide and both rely upon a winlogon notify package which is not approved by Microsoft for modifying the Password Change dialog or other Microsoft GINA related functions. Such clients make assumptions that are not guaranteed by the Windows architecture.